Mistakes are easy. As soon as we’re born, they begin. And without fail, they mark our inevitable rite of passage in the long, drawn out business of growing up. Hot stoves hurt. Hitting your brother is not nice. What we make up in our own minds is mistaken, over and over again, for reality. It’s all about the repair. This was not my shining moment as a parent. 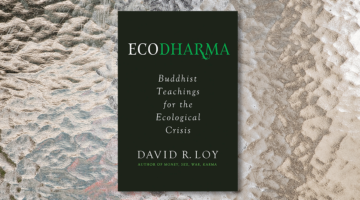 There I was, with already twenty years of meditation practice under my belt, and I was throwing a completely dualistic fabrication of a story at him that was more a reflection of my lack of composure than anything else. For one thing, what’s wrong with driving a truck? And surely, there would be a great many opportunities beyond that, regardless of his scholastic achievements or lack thereof. The saving grace was that I saw what I was doing right away. This is what meditation offers us. The fruit of our practice is not miraculously never making mistakes again. It is, rather, seeing clearly what’s actually going on, so that we can then find our fitting course of action. We were both stunned. I hadn’t planned on saying that. We had never discussed the possibility before, even though my son had suffered difficulties and indignities in school since kindergarten. Now, suddenly, our world opened up to change. To make a long story short, over the course of the next few years we cobbled together an unconventional learning experience for him. He ended up graduating from the University of Washington with honors and went on to establish himself in a rich and stimulating career and life. While this may seem to be an over-tidy account of failure and redemption, it provides an example of ordinary human life. Many of us were raised by imperfect parents and schooled as apprentice human beings in a sometimes dysfunctional world. Whether the upbringing was overbearing or lax, painful or coddled, at a certain point we were let loose. Mayhem ensued. Which way to go? Here and there, gross and minor errors appeared. Mistakes are inevitable and in order to live a meaningful life, we have to, first of all, resist buying into a narrative of failure. Instead, we pick up the pieces and transmute them into a fitting, beautiful change. In other words, it’s all about the repair. 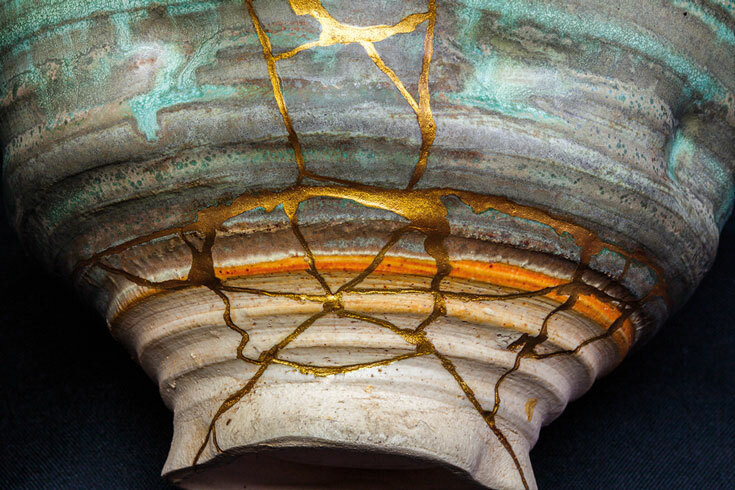 In Japan, in a practice dating back to the fifteenth century, highly skilled craftspeople developed the craft of pottery repair into a fine art, called kintsugi. The process basically consists of repairing broken pottery with lacquer that’s dusted and burnished with powdered gold. 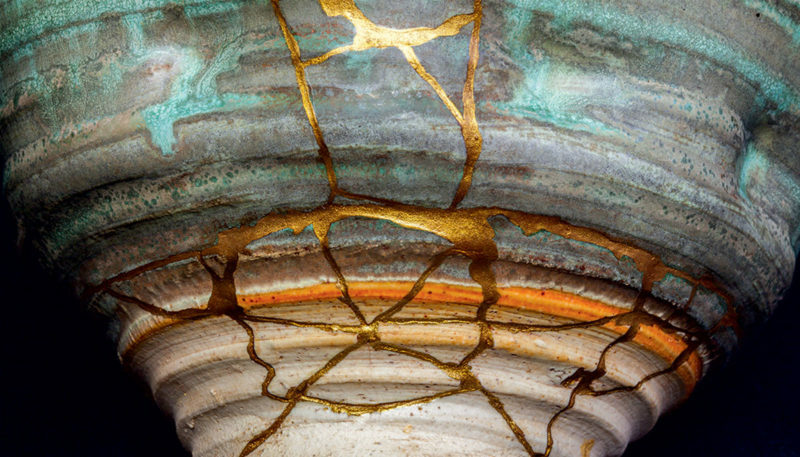 Rather than trying to hide the flaws, the pieces of bowls or pots or plates are lovingly reassembled and the lines where they were broken become highlighted with gold, marking them as precious objects honored and even prized for their imperfections. In kintsugi, the reality of brokenness represents an opportunity for the transformation of consciousness. What a wonderful metaphor for our lives. During the years while my son was in school, I was continually called upon to let go of my idea of what his and our reality should be. 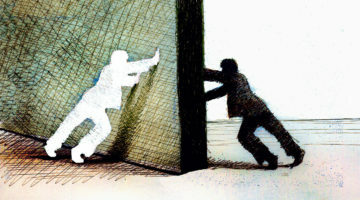 And on the other hand, we also had to be careful not to give up or deny the truth of our challenges. It was not an option to say that we were in a hopeless mess and leave it at that. What to do? This kintsugi art of golden repair requires, first of all, a clear-eyed seeing of what is. All the fabricated stories about how impossible the situation is, or how our devastations might be assigned, categorized, or clung to—all are brushed away. A space is made clear for repair. From that place, we can find the pieces through inquiry, as I did when I managed to finally ask my son, “Are you suffering?” Once found, the pieces can be assembled. Present moment reality, along with the love and compassion we bear for it, provides the glue. The gold dust is, I suspect, the wonder of being so unmistakably alive. Recently I met up with my son for lunch and we were talking over some old times. I asked if he remembered that incident from high school, twenty years ago, when I told him that he was going to end up as a truck driver if he didn’t start doing his homework. He didn’t remember it, and laughed when I described how ashamed I was of my reactive, dualistic behavior then. But then, somewhat sheepishly, my son smiled and said that he and his partner were now struggling with their son, my beloved ten-year-old grandson, who had begun to develop a stubborn aversion to doing his homework, just like his equally beloved father. And so it goes, the fragile, spectacular process of taking up what is broken and making repairs begins all over again. Just imagine the fine art of kintsugi extended so thoroughly throughout time and space, tenderly addressing every conceivable broken place until all of it is sheer gold. May it be so. Anita Feng is the guiding teacher for the Blue Heron Zen Community in Seattle. 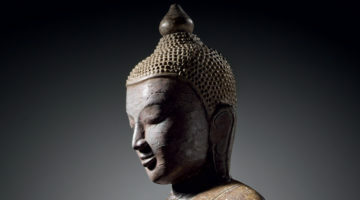 She’s also the author of Sid and a sculptor of clay buddhas.